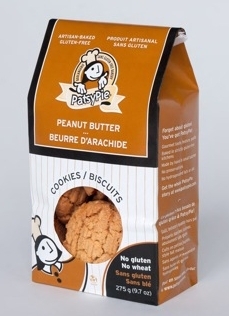 GF Ontario Blog: PatsyPie Gluten-Free Review and Giveaway! PatsyPie may just be the greatest company to ever exist. Just so happens that everything they make is gluten-free. 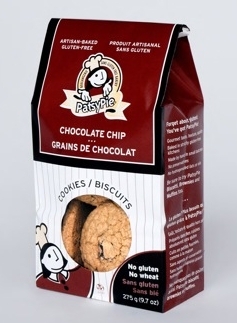 The company is in Quebec but the products are available all over Ontario in health food stores and some grocery stores, including Metro, Sobeys and Loblaws. 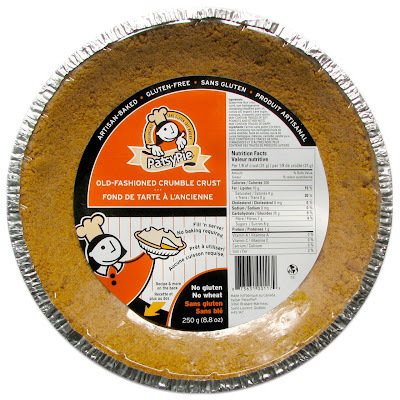 At the CHFA trade show a couple weeks ago, I got a chance to stop by Patricia's booth and noticed the company just introduced a gluten-free pie crust, similar to a graham crust. It requires no baking so you can just fill with your favourite pie recipe and you're all set. Visions of banana cream pie danced through my head. I had the opportunity to speak with the owner/founder of the company, Patricia, through email. I asked if I could review some of her products right here on my blog and she happily agreed. Sweet cranberries and orange zest come together for this perfect combination. Just how I remember biscotti! Excellent dessert or paired with a cup of tea to end a long day. Crunchy chocolate chip cookies are definitely one of the comfort foods missed by most of those following a gluten-free diet. You don't have to sacrifice great taste - these cookies are packed with tons of chocolate chips to satisfy that milk-and-cookie craving! Remember those gluteny two-bite brownies that melt in your mouth? I almost think someone sneaked them into my PatsyPie package... no wait, these are better! I find it hard to believe these are gluten-free. The Peanut Butter Brownies are to die for. The perfect combination of peanut butter, real peanut chunks and rich chocolate in a chewy two-bite brownie. Delicious! These may just be my new favourite cookies of all time! Just the right amount of ginger and crunch, this was the first bag to disappear around here. These all natural Snappy Ginger cookies are excellent with hot tea or a glass of milk. 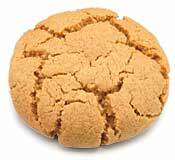 Better than any peanut butter cookie I've made at home, these cookies are the real deal. They even have REAL fork print marks on the top! Again, perfect crunch, little bit chewy and oh-so-yummy! 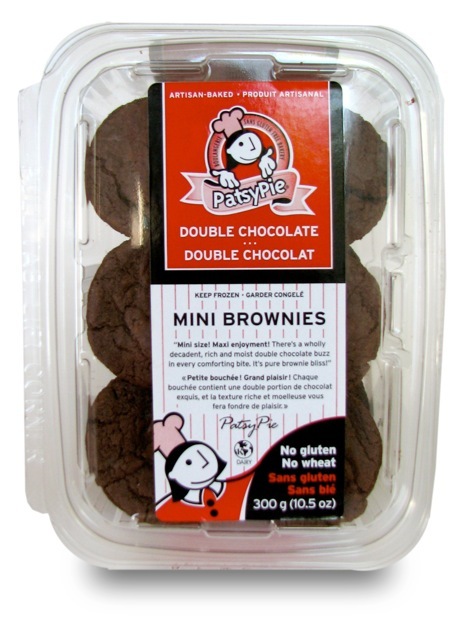 All PatsyPie products are made in small batches with no chance of gluten cross-contamination. It was Patricia's mother-in-law who taught her how to bake. 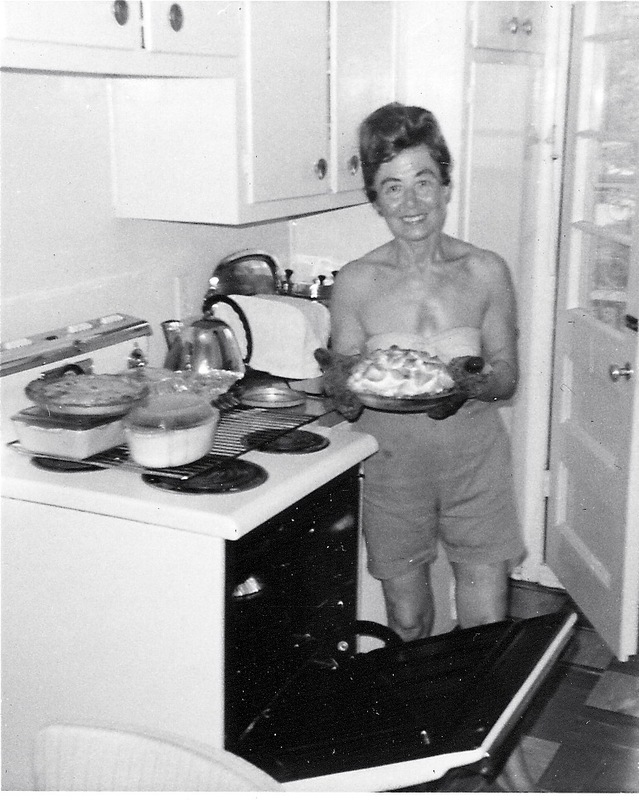 Her husband's family had a tiny restaurant in Trenton, Ontario when he was growing up and her mother-in-law made 30 pies a night for the restaurant. The inspiration for PatsyPie's products! So up next - PIE review! I think PatsyPie is the first pie crust in Canada similar to a graham crust. I decided to make that Banana Cream Pie I'd been dreaming about. It was really quite easy. Since the pie crust does not have to be cooked, I made up a batch of Kraft Cook & Serve Banana Cream Pie, poured it over sliced bananas in the pie crust and topped with some MimicCreme Healthy Top (non-dairy) Whipping Cream. It was sooo good! I ate the whole thing myself! 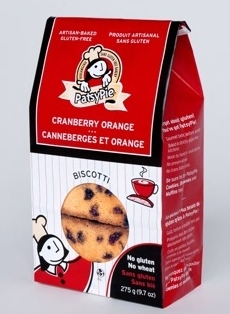 PatsyPie products are available in health food stores across Ontario. If you don't see them, ask your favourite store to order them in for you! You can also order directly from the PatsyPie website. What kind of pie are you dying to make with PatsyPie Pie Crust?! Post your dream pie in a comment below before 11:59 EST on Sunday, November 20, 2011 and you will be entered to win a gift basket from PatsyPie! One winner will be chosen. EDIT: PatsyPie will be choosing TWO WINNERS! Please include your name (as it appears on Facebook), your Twitter handle or sign into your Google account to comment so I am able to contact you when/if you win! This contest is open to Ontario residents only! (This is Gluten-Free Ontario, after all) The winner will be chosen by Pat of PatsyPie and I will post the winner's name by Wednesday, November 23, 2011 on Facebook, Twitter and on this page. Please check the PatsyPie website for ingredients if you have any allergies. All of her products are completely gluten-free and made in a dedicated gluten-free facility but they do use nuts, peanuts, eggs, corn and other potential allergens. Paula Anne Parent and Little Voice! My dream pie is really anything pie...however there is one in particular. It's a chocolate Bailey's cream pie, with a touch of coffee. Creamy, decadent, and delicious. I would love to try to make a key lime pie! I haven't had one in a very very long time! Well Jax's banana cream pie looks awesome.... but maybe something more chocolatey.... or maybe cheese cake! or even chocolate cheesecake! Oh! the possibilities! Squeeee! Oh my...the options are endless...but if I had to pick just one (against my will,lol)...it'd have to be Sweet Potato Pecan Pie. If you haven't tried it..it's a must!! I've had it with reg. gf crust..but it's just not the same. With the Christmas holidays coming..it'll be perfect!! Oh my..the options are endless! If I had to pick just one (against my will, lol) it'd have to be Sweet Potato Pecan Pie. If you haven't tried it, it's a must!! I've had it with reg. gf crust, but it's just not the same. With the Christmas holidays coming, it'll be perfect!! I would do either key lime pie, or pumpkin cheesecake. Either would be abolutely delicious! My dream pie would have to be blueberry pie. There's something so comforting about warm blueberry pie with a little whipped cream and ice-cream on the side. This pre made pie crust sounds like such a life saver! I have tried many different mixes and the crust either does not come out right or it is way too time consuming and messy. Can't wait to see this on store shelves! well if it's a graham cracker type crust, it's gotta be lemon meringue pie! I love cherry pie and would love to make a cherry cheesecake pie by throwing some cream cheese into the mix. Yummy! Thanks for making so many tasty gluten free products! This would be THE perfect crust for a Pumpkin Chiffon Pie! It's my favorite pie and I remember when my mom used to make it for me when I was younger. Since being diagnosed with Celiac, I've tried every type of pie crust to replace it, be it a brownie crust, or a regular crust...but nothing seemed to work as well. Finally, a graham-type crust that is gluten free! Can't wait to try it out! I would love an apple pie right about now. I have found Natrel Lactose free whipping cream and veggie chunk cheese, just waiting for a good apple pie. Chocolate-banana cream pie! Or should I say cocolate-banana DREAM pie!?! My Dad's favourite pie is a Boston Cream Pie or a Banana Cream Pie. He has a tough time with being celiac and I would LOVE to make him something that would feel like comfort food to him. This is such a great post to share news about GF living & awesome start ups. Thanks for posting! Gluten-free pre-made pie crust is probably the best news I have heard all day. I didn't get to partake in any of the pumpkin pie at Thanksgiving this year because it was right around when I started eating g-f, so I'd probably make that. Or frozen pumpkin pie! I would love to make either a pecan pie or an apple crumble. Oh who am I kidding, I would make both. These have to be my top two pies in the world and ones that I miss, not everyone makes these in gluten free. It would be so nice to be able to put one of these together to serve my guests. Mile-high lemon meringue pie just like my mom makes (except safe for me to eat)...or a cookie pie (sugar cookie baked into the bottom of the pie shell and then cheesecake on top of that). The possibilities are endless...I was also envisioning a pie that would taste like smores. Graham cracker type crust with chocolate cream and marshmellows....delicious! I have not had a really good graham crust pie in a long time. I would die to make a good banana chocolate silk pie with whipped cream. Although I have a great receipe for a gluten free traditional pie crust having a premade crust would make things so simple. I can't wait to try this. I like pretty much any pie. I guess if I had to pick a favourite it would have to be apple pie or pumpkin pie. Since I'm French Canadian, I would have to go with sugar pie! Every Christmas, our family gets together and my grandmother makes the best sugar pies. I have had to look at everyone savor their piece for the last 10 years since I have been diagnosed as a celiac. Could this be the year I get to have my own piece of the pie? I would love to enjoy a cherry pie!! I am sick of eating "just the filling" because i can not find a decent pie crust!! I would also add a decorative top (basket weave) to make it more "realistic"!!! Pumpkin pie with a caramel topping and whipped cream! I so miss my aunt's cherry cheesecake made on a graham cracker crust...she used to make them all the time when I was little and I'd love to have one. definitely banana cream pie!! Or coconut cream pie... or a banana coconut cream pie.. yum! wow, that's a great question. So many pies come to mind - apple, blueberry, cherry, lemon, banana cream, coconut cream, but if I have to choose just one, I would make a Mississippi Mud Pie. Thanks for the review! I've tried their brownies but not the cookies or the pie crust. That is such a great idea. I can make my own crusts - both dough and crumbly but I love the idea of having one ready to go. Who doesn't love pie?? I think my first choice for pie would be cherry but as I'm guessing you could use this as a base for cheesecake, I'd definitely try that too! Thanks for the giveaway! MMMM a chocolate bourbon pecan pie! I make it with a normal crust, but this would just kick it up an extra yummy bit! I'm almost drooling thinking about making a key lime pie. It has always been my favourite. My mom used to make me strawberry-rhubarb pies when I was growing up, but I haven't tasted one in years. That would definitely be my first! Strawberry pie, because he made that for me on our 3rd date! I used to love to bake apple pies for the family - something my almost 10year old granddaughter could not have, so I quit making them - guess we will be making some together! She loves to bake! I would love to make a pecan pie that wouldn't be overly sweet but full of protein-heavy, healthy nuts - so I could enjoy it in the morning with a lovely coffee and watch my kids lick their fingers after eating it. Mmmmm, a man's dream - a coconut cream pie with toasted coconut spinkles on top. I have been Gluten-free since 24 (6 years) and have been waiting for a crust like this!! Thank you so much! Oh my! How come I did not see this until now! I would definitely choose to make a key lime pie - with real key limes that my mother in law would bring back from Florida over the Christmas holidays. Maybe a chocolate cream pie, or even my Dad's deep dish apple cranberry pie. My mouth is watering now, so I must stop. Thanks for this opportunity, Jax! Definitely Key Lime or Lemon Meringue! I love Dutch Apple pie. 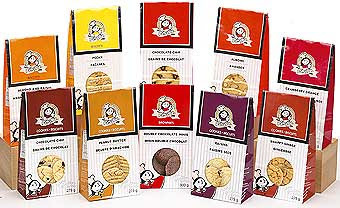 I love Patsy Pie products!! I love Dutch Apple pie, and I love Patsy Pie products!! I'm dying for key lime pie!!! been dreaming literally of having some..
Shoo Fly Pie. You know, a little molasses, baking soda and a nice crumble on top. Haven't had this one since Mum made it all those years ago. Makes your tummy say Howdy. Hi Jax - I consulted with Thomas and I think we would have a piefest making several pies at the same time. The piefest would include Lemon Merangue pie, Aunt Ruth's Banana Creme Pie (famous in our family) and Key Lime Pie. Being able to have an instant pie crust ready to fill means we would have pie more often! Dreaming of a chocolate pecan pie and drooling all over my keyboard!!! Mmmm!!! Sandy Flietstra - I would make a chocolate pecan pie. Yum! I absolutely love coconut cream pie with banana cream running a close second. I have been looking for a good substitute for graham wafer crumbs for quite some time now. I would love to make banana cream pie just how you described it. My mom used to make this when I was a kid and I have missed this super easy yummy dessert. I would love to make a cheesecake! I make crust-less cheesecake sometimes, but am really craving one with a graham crust! Okay, now that I've realized the giveaway is a graham style crust, here's what I'd make. I have never had cheesecake with a crust, as was diagnosed when I was very young.I would make a Classic Cheesecake,heavy on the vanilla bean, and homemade cherry compote on the side. My dream pie is pumpkin pie. Hi my name is Kay Surujballi and I was diagnosed with Celiac Disease in 2007.I've tried to be gluten free but I find it difficult because I'm the only one in my family who has this disease.There are several pies that come to mind but my dream pie would actually be strawberry cheesecake.Thank you. I would love to be able to make a beautiful cheesecake.However there are so many other pies that I love,it would also be wonderful to learn to make them gluten free. I would definitely make key lime pie! It is my favourite pie ever! It would be great to be able to make one quickly and easily! Would love to make a lemon pie as my kids call it! Have not had one in over a year since going gluten free. Can't wait to try one! Well I am a newbie on this gluten free stuff right now. My 9 yr old daughter just found out that she is no longer allowed to have gluten. So She really likes apple pie so I guess this will be the first pie that I would try!! Oh did i say how hard it is to get or make something that she will eat!! If there is anyone out there to help or know someone please email me.Thank you!!! I would make an old family recipe of no cook chocolate pie filling with whipped cream piped around the top. I would love to be able to make my daughter-in-law an apple pie. Apple pie is a family favourite served with a slice of old cheddar cheese. It would be so good to be able to share one with her!